One of the Silver River experts will be on hand during “open weave”, but this is not “teaching” time as we will be working on projects of our own. That said, we are available to give advice and support if you runs into issues with your project. 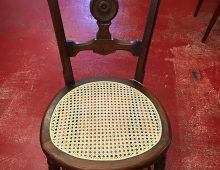 This is intended as an independent study with the support of the seat weaving community behind you! Part of our mission at Silver River is to inspire an appreciation for the art of seat weaving. “Open Weave” sessions are an opportunity for our community to foster this love together. Our wonderful community of seat weavers is made up of everyone from new students to old hands and getting together spreads ideas, tools and techniques. 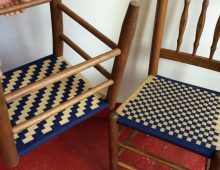 Picture a knitting or quilting circle…then replace the fabric with the seat weaving project of your choice. Materials: Participants can bring their own materials or materials can be purchased at Silver River. Any materials not carried in stock need to be ordered well in advance. Tools: Weaving tools will be available, but we suggest to bring the tools you are comfortable with and observe/try what other people are using.